For some time now the Canadian dollar, colloquially known as the “Loonie” because the Canadian dollar coin features a picture of the common loon, a bird that is indigenous to Canada, has been losing value. Canadian interest rates are at an historic low level of 1%, something that is very welcome to Canadian mortgage holders. Now there are indications that the factors that have been contributing to the lowering of the Loonie are close to being fully priced in. This means that it might be time to start looking at the possibility of trading a rise in the Canadian unit. 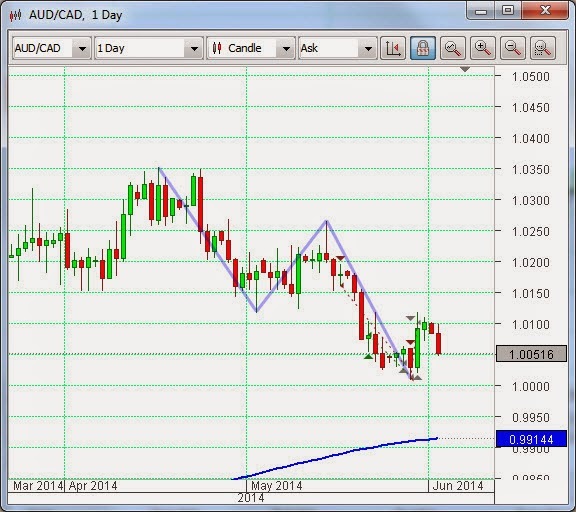 As can be seen from the chart above, the Canadian against the Aussie dollar could be starting a downtrend. Because of the way the pair is designated, this would mean a lowering of the Aussie and a relative strengthening of the Loonie. As we know, lower highs and lower lows are indicative of such. Both of these countries are heavily involved in the production of hard commodities. Each of them was more successful than other developed economies in avoiding the worst effects of the recent Global Financial Crisis, which is still working its way out of the system in the USA and Europe. And both the Aussie and the Loonie are heavily involved in the carry trade, where investors borrow money in low interest rate jurisdictions and effectively lend it out in those countries where they will be paid a higher rate, allowing them to count the difference as profit. Apart from the Non-farm payrolls data in the USA during the coming week, of serious import to currency traders will be the rate decisions and accompanying remarks from the central banks of Europe, Australia and Canada. No changes are expected in Australia or Canada (but see above), while as far as the ECB is concerned all participants wait with bated breath to see if Mario Draghi and his colleagues will deliver on their oft repeated promises (threats?) to carry out measures that will have the effect of increasing inflation in the Euro zone and, thereby, tending to decrease the value of the Euro. The markets have been expecting something of this nature since last month’s press conference, when the rhetoric was on the side of considerable easing to come in the Eurozone, and the Single Currency has been softening. If it transpires this week that the measures announced do not go far enough to fulfil those expectations, the direction of the Euro will once again be to the upside.